We are surrounded by cams, like we saw last month - they are literally in all of the machinery that powers the world today. But increasingly, despite their popularity and efficiency, they're being shown the door - at least that is what I see in the changing trends in the auto industry. 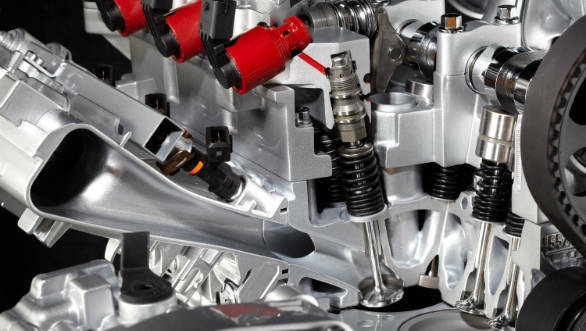 Cams have already fallen out of favour in fuel pumps, fuel injection and distributors and it looks like, more areas of application will follow. In today's internal combustion engines (ICE), the cam's central role is to open and close inlet and exhaust valves, a job they've held for over a century now. That position could close - because the Governments need the ICE to be ever more fuel-efficient. Every passing day, the regulations become stricter and the cams job becomes more impossible. And the electric (cam-less) automobile is looking the increasingly likely candidate to end the ICE reign. If the ICE is to challenge intelligent hybrids and electric cars tomorrow, it must become more intelligent too. This intelligence isn't the preserve of the cam - it cannot think, process, adapt or improve on the go. Each of those things, is why more electronics enter the ICE world and in our case, threaten the cam itself. Let's consider an example. A cam has a fixed profile designed to make an engine run at peak efficiency (the range from peak torque to peak horsepower) for a very short rev range. The Honda CR-V, for instance, makes 300Nm at 2,000rpm and 120PS at 4,000rpm. As in its best performance stays only between 2,000 and 4,000rpm. But in dense city traffic, where the CR-V might find itself often, the engine is below 2,000rpm, making less than full use of the fuel that it is burning. Which might be emissions-legal today, but may not be tomorrow. Why is it like this? The engine's efficiency depends on the efficiency of the airflow in and out of it. This determines how every drop of fuel is used by the ICE. This depends, naturally, on the valve timing (when the valves, open, shut and how far they open). A mechanical cam can only achieve the best combination of these for a limited rev range. If this car has variable valve timing, then you can use two or more cam profiles to widen the range during which the air flow is optimal. But since you cannot cram an infinite number of cam profiles into an engine, some wastage will always be there. To reap the full benefits of optimum air flow, we need the valve operation to be able to adapt continuously as the revs rise and fall. The new way of doing this uses electromagnets (electricity), hydraulics (oil) or pneumatics (air) to control valve operations. Bye bye cams. Hydraulics have replaced mechanical things in many places already. The high pressure hydraulic oil can be used to open or close a valve using a solenoid (electrically activated) valve similar in principle to the one in the fuel injector. So the electronics can use the solenoid to release the oil to work the valves as and when required. Valve lift can be controlled by a bypass solenoid with a small pressure variation. Since this system isn't linked to the engine, valve operation can be altered continuously to achieve the best result at all revs. Think this is theory? Fiat's Multi- and TwinAir engines run almost exactly this system. And they're both award-winning engines with benchmark efficiency. A pneumatic system will work more or less in the same way, using air under pressure instead of the oil. Obviously, you do need to have high pressure air onboard - needs a compressor and a storage tank. That can be expensive and cumbersome. Electromagnetic valves are simpler. They use an electric coil wrapped around a valve. The magnetic field that emanates when current is passed through the coil operates the valve. We use this principle in almost all electric equipment we use today. The magnetic effect can pull or push the valve as per the current's direction. And more current you supply, the hard the pull or push - that's the way to control valve lift. An ECU can choose how much electricity is needed for the coil to do its job, squeezing the maximum out of every drop of fuel and improving efficiency. Electromagnets work without a physical medium like oil or air, react super fast and are extremely efficient. They also are easier to package and require less space than a hydraulic or pneumatic system. Redundant systems can be built in to prevent an electrical fault, which completes the system. Many manufacturers are working on this as we speak and I expect that it's just a matter of time when the cam will be a part of our engineering history. This is the future, and it's ironic that while these valves might extend the life of the ICE, it requires electricity to save the combustion engine from the onslaught of electric mobility. Strange world..